Resicast has possibly the most-detailed 1/35 British figures I have seen, especially their line of paratroopers. I have reviewed a number of the Resicast Paratroopers before, but this is a look at a slightly different figure, one in a more action-type pose, and placed in a small setting for convenience. This chap is unusual in the reduced order of dress he comes in, so let’s have a look at what you get. 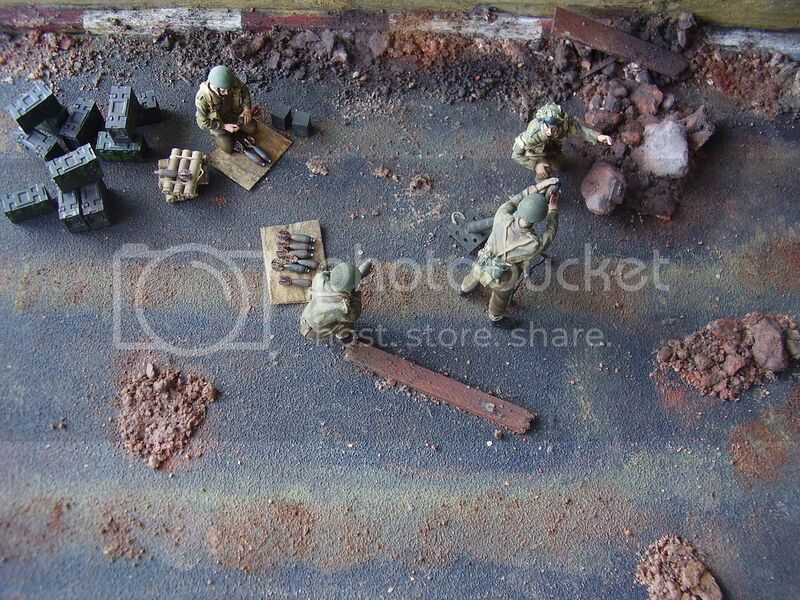 To mount the figure, you also get a small resin base depicting some ground-work and a fallen tree part. 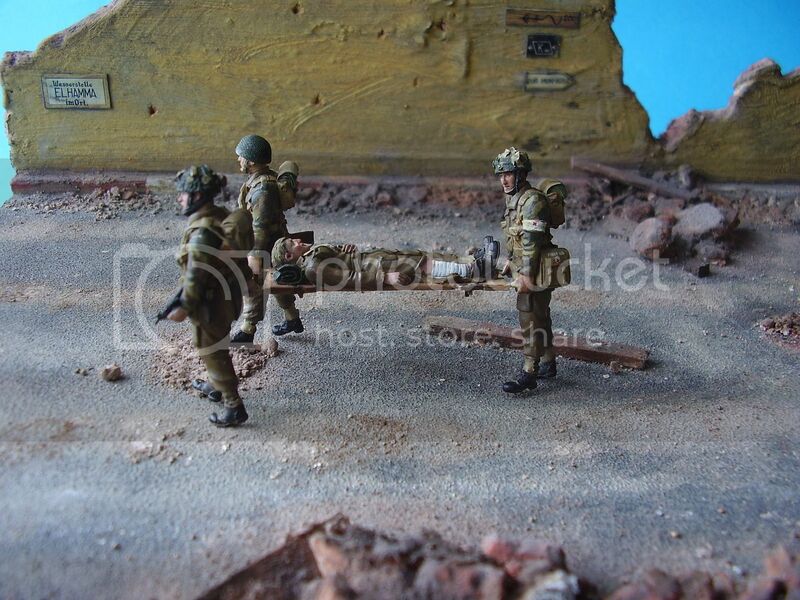 The Body: The pose shows a soldier lying down firing a Mk V Sten gun from behind cover, and is designed to fit onto the supplied base (if you so wish). The Mk V was the special paratrooper version with a pistol grip, front grip and bayonet lug. More than 350,000 Mk Vs were manufactured before June 6, 1944. The figure is dressed in a Denison smock, paratroopers trousers, anklets and ammo boots. The sculpting of the uniform looks good, the smock and trousers have nice, natural-looking folds, and the trousers and jacket have well-detailed pockets. Unusually for an action figure, this trooper wears no webbing, so I would think he is very much a “defender” rather than an attacker. The smock is open at the neck, and there is evidence of a shirt beneath. The detail here is a bit weak, and a camouflage scarf around his neck would most probably have been more appropriate, but that’s an easy fix if you so wish. The Head: The head, as with all the Resicast paratrooper heads, is excellent and shows the face of a youngish soldier. He’s wearing a paratrooper’s helmet covered with netting, and the correct chin straps are in-place for this helmet. The Arms: The arms come separately; the right one has a Mk. V Sten gun moulded in-place, with the left hand also attached to the gun. The lower part of the arms show the knit-type cuff making this an earlier version of the Denison smock. You also get a separate magazine to attach to the Sten gun. Provided with the figure is a small resin base on which to mount it. The base has some ground work, with a small rise in the height on top where a log sits from behind which the paratrooper is firing. This is a plus for figure painters who like stand-alone kits, and provides a woodland setting for the soldier. The detail on the base is good and should paint-up very well. This is a very good action-type figure. The lack of webbing leans him more towards being a defender, though separated from the base, he could be positioned just about anywhere. However, having been studying up on Operation Market Garden, I think he very much fits the into a defensive setting the 1st Airborne Division found itself in after their failed attempt to break thought to Arnhem Bridge. The overall casting is excellent and the pose of the figure looks very natural to me. As he comes without kit, you might want to add a bit of equipment around his location, but that is really a personal choice and would depend on your setting. The fallen log could be in an urban or woodland location, so that is also quite adaptable. This is one of a number of action-type paratroopers that Resicast do, and I shall be looking at their Para 2 inch Mortar Crew sometime during the coming month. Highs: A very useable action type Paratrooper. Excellent overall detail and casting. Lows: The neck of the shirt detail is a bit weak, although I don't think this is will be a major issue when his head is on. A good review as always Alan, but the picture on the box is very poor for an advertisment of the product.